Synchronize your Stickies to your iPod and/or iDisk. Is there a better alternative to StYNCies? Is StYNCies really the best app in File Management category? Will StYNCies work good on macOS 10.13.4? 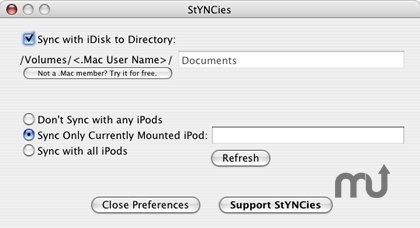 StYNCies--a neat little utility from Russotle that synchronizes your Stickies to your iPod and/or iDisk. Mac OS X 10.2 or later, an iPod and/or iDisk. StYNCies needs a rating. Be the first to rate this app and get the discussion started! StYNCies is an OS X (10.2+) application designed to stay out of your way but be there when you need it. It syncs your Stickies with your iPod when you connect it to your Mac and syncs them to your iPod and/or iDisk on demand. Specify the iDisk location to upload Stickies as nicely formatted HTML through the Preferences panel; your stickies get written to a "StYNCies" subdirectory of that location. For example, if you specify "/Volumes/<.Mac User Name>/Documents", the your notes get written to "/Volumes/<.Mac User Name>/Documents/StYNCies". An index, index.html, is also written for convenient navigation of the notes. StYNCies works on all generations of iPods. On 1G & 2G iPods, it syncs the notes to your Contacts folder and prefixes each note with "!" for grouping purposes. On 3G and newer iPods, it syncs notes to the "StYNCies" subdirectory of the Notes folder. Features to sync them with WebDAV shares and possibly other remote locations are slated for the v1.0 release among other neat things. A feature to enable modifying and synchronizing changes from the Web is also being considered. Please share your thoughts and suggest any feature requests you can think of. You might just get what you ask for!